S-2010F On Camera LED DV Light for use with Swit S-8770/8970 Batteries and Sony NPF Style batteries. For use with Sony VX2000/2100, PD150/PD170, HVR-FX1/Z1 Camcorders. Includes the S-7200F Sony Style Battery Mount Adapter. The new professional S-2010F camera light combines 4 advanced LEDs with SWIT optic technology design. The S-2010F offers the equivalent of a 40w output at 5600k colour temperature with a low power consumption of only 12w with low heat radiation. The S-2010F can last in excess of 100,000 hours and requires no spare filament bulbs. 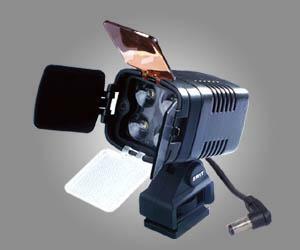 The new professional S-2010 camera light combines 4 advanced LEDs with SWIT optic technology design. S-2010 has improved lumen output 50% more compared with the same category of products in the world in much smaller volume. It offers high output and consumes low power with the unique LED technology. The output is equivalent to a 40W bulb at 5600K° daylight color temperature while requiring only 12W of power with low heat radiation. S-2010 has the long lifetime over 100,000 hours, requiring no dichroic filter and spare filament bulbs.With the color compensating filter you can also change to 3200K° and the new dimmer enables you to adjust the illuminace easily. The S-2010 is uniquely designed for DV camera with the bracket S-7200F/P/J.